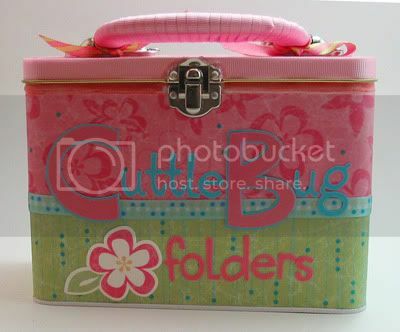 I have a few cuttlebug embossing folders and kept them in a plain white provo craft tin. I decided I should cover it so here is how it turned out. I used an old scrapping kit from Stampin' Up. American Crafts ribbon (it is on there straight-for some reason the pic makes it look wavy) and I used my Cuttin' Up Cricut cartridge to make the letters. The pink ribbon on the handle is not from American Crafts but I don't know where it's from. I made a light box to take pictures of my cards and stuff. Here is the tutorial I used.